A ground report from Amethi- Who will win the seat in 2019? I came back to London from my visit to Amethi last month with one definite, but unfortunate, conclusion. No Sunni Muslim is voting for BJP. Whether it is my taxi driver Ali in Lucknow or my hotel waiter, Jaffer, or Mohammed Zakir, the owner of National Medical Store in Ali Miya Chowk in Rae Bareli or Abdul Jabbar, the fruit vendor in Amethi market or a bunch of muslim men enjoying tea at the main road in Jais or the Muslim weavers from Varanasi visiting the Ambedkar Park in Lucknow, story is the same; hum bhajapaa ko vote nahi denge sahib. 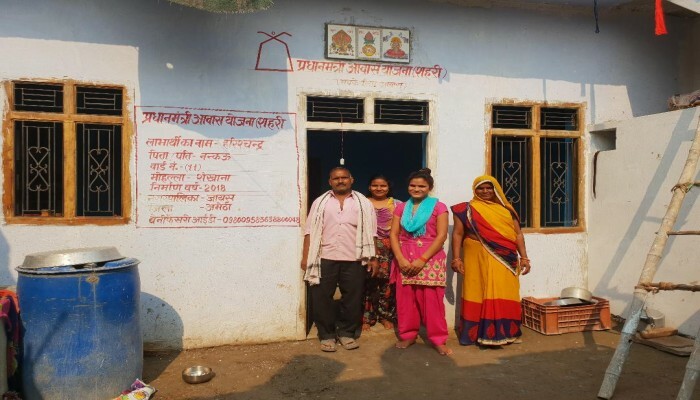 The entire family of Gudia Banu and Kaiser Banu in purana Raipur Phulwari Village had nothing but complaints in terms of how just Rs 4000 was being distributed in the first instalment for toilet pits while the cost was higher. It is another matter that the women were challenged by 86 year old Mathai, a Paasi-SC (Saroj, in local parlance) who said that the government had done quite a bit in the village including getting some of them houses and how they ought to be grateful. What is it that motivates Jaffar to say that he and his wife, Najma Banu, hailing from Balipur village and the families of his cousins Roshan Jehan and Moharram Ali, hailing from Ramnathpur and Gopalpur, all in Amethi Taluk, will not vote for BJP when he readily concedes that two families including his own already have got houses under PMAY scheme and the families of two others have been shortlisted for the same? Jaffar and his relatives have already received 4 lacs and they will receive 2 more lacs for the 4 houses that they will have ultimately got. Well, it is another matter that it is actually 1.2 lacs per unit of 25 sq metres or 2.4 lacs where 2 units are constructed together, depending on the need, that actually goes into the accounts of the recipients, mostly women, directly from the government, but then you have to reckon with the village Pradhan (Beeru Yadav, for example, in this case) who does the ‘paper work’ that gets 20K for every unit. For one, sentiment overrides much else. This is so, particularly when a community, be it religious or caste or any other group, feels hurt or is constantly told that they have a reason to feel hurt. This sentiment stays at the subconscious level and invariably dictates your mood and resultant action. The constant description of BJP in general and Modi in particular as anti-muslim has taken its roots and it is difficult to change that perception spread by motivated media in an environment where few BJP foul mouths happily aid that with their out-of-turn and chest-thumping statements to no effect other than to ending up humiliating the community at the local level. Add to this the outsized influence of community and caste leaders in villages, mosques and mohallas, the damage is complete. Incidentally, I had a first-hand experience of how much caste matters in UP when the paanwalla in Fursatganj, a Jaiswal, warned me sotto voce that the men I was striking a conversation with were from low caste and I might like to stay away from them. The story is diametrically opposite with many Hindus, particularly Hindu women. Village after village, I came across women all in praise for Modi. They have heard of Smriti Irani but it is Modi on their lips. I spent quite some time in the mohallas near Devi Patan Mandir where, without exception, families spoke of something or the other that the government had provided them – toilets, houses, gas connection or loans – and spoke of the PM glowingly. This, notwithstanding the fact that Mithilesh, for one, who has got a house under PMAY but no toilet yet, as she has not been able to save enough money to bridge the gap between what the Scheme gives and what it costs to build one, has to wait till it is dark to go the fields and ease herself. Shirpa Chaurasia and Manoj Kumar Soni of Nawan Tola mohalla in Phulwari village along with a few other families that had gathered around us were gung-ho about Modi and were keen to show me their houses built under PMAY as well as their new toilets. An interesting aspect of my conversations here over tea and biscuits was that the families did have positive feelings for both Akhilesh and Mayawati too although none in their estimate matched Modi when it came to actual delivery on the ground. One exception to this all though was Gauriganj. While none spoke against the PM or BJP, the mood generally seems to be in favour of SP or, by default, Congress, for the lok sabha. This may come as no surprise though as this was one constituency that did not vote BJP but chose a SP candidate as MLA in the last assembly elections too. In nearby Jais, a majority Muslim town, I came across several groups of Muslim men who had nothing positive to say not only of the PM but they were also disparaging of Shia Muslims and referred to them as sold-out folks. When I asked them if some in their community were beneficiaries of PMAY scheme, they conceded they were but that was still not good enough for them to vote BJP. My own sense is, SP enjoys greater acceptance here than Congress and that the latter benefits only because SP leaves the field free for Congress. Indeed, it should speak volumes for how discerning people can be, when not swayed by sentiments, that the local VP of the Samajwadi Party, Rashid Jamaal Jaisi, should dismiss RaGa by saying ‘bahut garam garam bolte hain, sahab’. Strangely enough, the Congress office in Gauriganj was empty but for an odd worker, Mohammed Zama, while the much smaller BJP office had three people being busy at their workstations. One of the three told me that if only they could arrange the last mile connection and provide 3 KW energy to the farmers, the latter’s problems could be taken care of and the constituency fully secured for the party. I had an interesting conversation with young Akleem Khan and his wife at the Amethi railway station which, by the way, was very clean. Akleem had come to visit his ill father near Amethi and was going back to Bhopal where he worked. He was all praise for Mamaji and felt that the CM would come back in MP. He added for good measure that the farmers were happy in MP and that was why he was saying it. When asked what he knew about farmers, he said that he was in car electrical work and many of his clients were farmers that brought trucks to him and he saw them as happy and really getting better economically. Was he speaking only of rich farmers, perhaps? His wife Rukhsana too was pleased with the gas connection but not with the level of subsidy. She was also not happy either with the government’s triple talaq decision. The road from Lucknow to Jais was pretty good with it being mostly a dual carriageway. From there to Gauriganj was not bad either but the stretch from Gauriganj to Amethi was mostly a single lane. The roads inside Amethi town and the Amethi market though are in need of some tender care. I was also pleasantly surprised to see my mobile phone working both the days I was in Amethi with the data signals strong enough for me to get my London phone tethered. So, what is my take on Amethi 2019? Would RaGa fight from there, in addition possibly from a southern state, or would he move to Rae Bareli and inherit the Congress President’s seat and have his sister Priyanka give a fight to Smriti Irani? I think it is fairly given that Smriti would fight from Amethi given her regular visits to, and how she has nurtured, that constituency. Smriti is a great campaigner and BJP honchos in Lucknow even spoke of the heavy demand for her from BJP candidates across the state given her excellent communication and campaigning skills. Of course Uma Shankar Pandey, the Amethi district chief of the BJP and Rajesh Masala, the local BJP strongman, vouch for the ground work done by Smriti and the party this time around. Ultimately though, 2019 is a binary. Does the country want Modi to continue as PM or not will be the question. Candidates will matter little although in the case of Amethi, Smriti brings enormous strengths as hardworking, well-informed, indefatigable and feisty campaigner. In political terms, between now and May 2019 is a millennium and much can happen. Even so, if I have to make a choice, I will place my bets on Irani/Modi, with motivated turnout of electorate on both sides.